Pet treats are slowly becoming everyday necessities, very much like pet food. With more and more products made easily available for dog and cat owners, making the right choice becomes more difficult. Whole Life Pet Treats is yet another brand that can give your pets a nice-tasting yet nutritious treat that they will surely love. Whole Life Pet Treats come in a full collection of flavors and variants for your cats and dogs alike. More than 40 treats variants are available at 10% discount at Amazon’s website. There will surely be at least one that would make your pet feel loved and happy. The different flavors of the treats are chicken, turkey, salmon, cheddar cheese, venison, beef liver, cod filet, organic sweet potato, lamb filet, classic meatballs, and others. Pick the variant that you know your pet will enjoy the most. Some pouches are pet treats that can be given to either a dog or a cat. So if you got both pets inside the house, they can share a pack. Product prices range from $6.01 to $67.64. Use the discount coupon and you’ll pay only $5.40 and $60.87 respectively. Your pets will definitely enjoy these treats, while you enjoy the discount. Shopping for pet treats has never been as easy and as affordable than this. Get them only at Amazon. This entry was posted in Whole Life. Bookmark the permalink. Buying pet food through coupons is cost-effective. 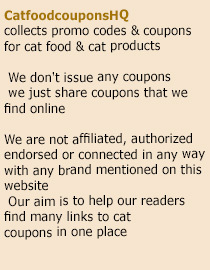 Sometimes you can get additional gift along with the coupon in any special offer.I always love to buy pet food online.